The objective of this 2nd workshop is to review the results of the 1st workshop as well as design and prototype mass participation experiments linked to some or all of the astronomy ESFRI facilities and their precursors / pathfinders. This will be a “working” workshop where we will take ideas for citizen science experiments relevant to ASTERICS, discuss their potential, and prototype the best. Do you have an idea for, or have you already developed, a citizen science experiment in the areas of astronomy or astro-particle physics? Are you looking to expand the capabilities of citizen science experiments and public engagement and learning from them? 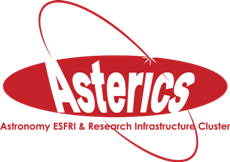 The ASTERICS DECS work package (https://www.asterics2020.eu/home) are planning a 2nd ASTERICS Citizen Science Workshop on 22-24 January 2018 at Istituto Nazionale di Astrofisica (INAF), Trieste, Italy. The objectives of this workshop are to review the existing ASTERICS related experiments and design and prototype new and exciting mass participation experiments linked to some or all of the astronomy ESFRI facilities and their precursors / pathfinders. To fulfil the first objective of the workshop showcasing existing experiments as well as the latest developments in citizen science and it pedagogy we are looking for presentations to be given on the first day of the workshop. If you would like to attend please register your interest using the link below and if you would like to give a presentation please send directly to me a preliminary title of your presentation (this can be changed later) and preferred duration (15, 30 or 45 minutes). In addition, to fulfil the second objective, this will be a “working” workshop where we will take ideas for citizen science experiments, discuss their potential, and prototype the best ideas. So even if your idea is not fully developed, you feel in need of guidance or you feel you can offer dynamic guidance please come along. Please also forward this invitation to anyone else you fell would be interested in this workshop. As the workshop content develops it will be updated at https://indico.ifj.edu.pl/indico/event/183/ and if you would like to register your interest in attendance please do so on this site.